A judging team from Paynesville Area High School recently took first place in dairy linear classification at Ridgewater College. Juniors Troy Buermann, Joe Hemmesch, Jason Kolb, and Tim Schrupp took first out of 15 teams at the competition, which was held in Willmar on Tuesday, Feb. 18. Dairy linear classification is a modern tool used by dairy producers for selecting replacement animals, said ag teacher Bill Ryan. For the competition, the students had to judge dairy cows based on their production records, breeding history, and a visual inspection of the animal. 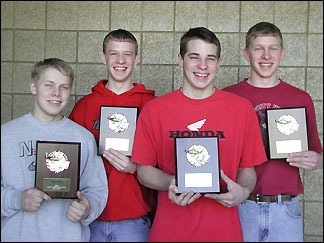 PAHS juniors Jason Kolb, Joe Hemmesch, Tim Schrupp, and Troy Buermann recently took first place dairy linear classification at a competition at Ridgewater College in Willmar. Evaluating beef and dairy cows is part of the curriculum in animal science, a class all four are taking. All four also live on dairy farms. Over 600 students from 28 high schools competed in the 19th annual Skills Fest at Ridgewater College. The skills contest included 35 areas, with agriculture, business, automotive, and welding being the most popular. Each PAHS student will receive a $200 scholarship to Ridgewater for taking first in the contest.